Do You Know to Merge into Traffic? We all face it on a regular basis – traffic jams on I-95, Florida’s Turnpike and other major roadways. This is often the results of motor vehicle accidents, distracted drivers, slow drivers in passing lanes, aggressive drivers, lane closures, and constructions zones. Now add in what many consider to be rude and inconsiderate drivers who ride the middle of the lane, or who buzz past you and wait until the last possible moment to merge. This driver behavior elevates the situation and often frustrates, irritates, or makes the rule follower, angry. Not to mention, putting your safety at risk with an increased chance for an auto accident or even a road rage incident. Merging on highways can occur on highway entrance ramps, at exit ramps connecting two major roads or at work zones or crash sites where lanes are restricted. Most motorists start to merge as soon as they see warning signs which can often be the beginning stages of long delays. For more than a decade the Colorado Department of Transportation has recommended the "zipper method" of merging when traffic is particularly congested and often in construction zones. With the zipper method, drivers use the entire roadway and take turns merging from the closed lane into the open one at the point when the road narrows. Their historical data shows that this method has reduced delays and queue lengths by as much as 35 percent. Missouri, Kansas and Washington are just some of the states joining the zipper merge push (late merge, dynamic late merger, passive zipper merge, and the active zipper merge). While some just use PR campaigns to introduce to drivers; Kansas has instituted electronic signs and are measuring the pace of traffic flow with Doppler radar. Missouri’s Department of Transportation (MoDOT) created a YouTube video called Kids Watch Adults Merge in Work Zones where kids watch and comment on adults in cardboard cars as they demonstrate work zone merging techniques, specifically a zipper merge technique. The MoDOT also produced another video showing the technique on a real roadway and provided some driving tips for merging in various situations. 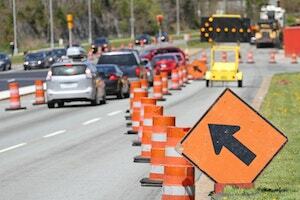 The Federal Highway Administration (FHWA) estimates that work zones accounted for approximately 10 percent of all the traffic delay in the United States and up to 24 percent of non-recurring delay (Federal Highway Administration, 2009). In addition to delays, work zones can contribute to an unsafe driving environment. Data from the Fatality Analysis Reporting System indicates that work zone-related crashes claimed 576 lives in 2010 with drivers and occupants accounting for approximately 85 percent of those fatalities. In addition, over 30,000 people are injured each year in work zone crashes (Federal Highway Administration, 2011). The American Traffic Safety Services Association and the U.S. Department of Transportation Federal Highway Administration have created Guidance for the Use of Dynamic Lane Merging Strategies which discusses merging strategies and how to implement.